TED hose, also known as anti-embolism stockings, are recommended by health care providers for individuals who are prone to poor leg circulation, deep vein thrombosis, extended periods in bed, etc. 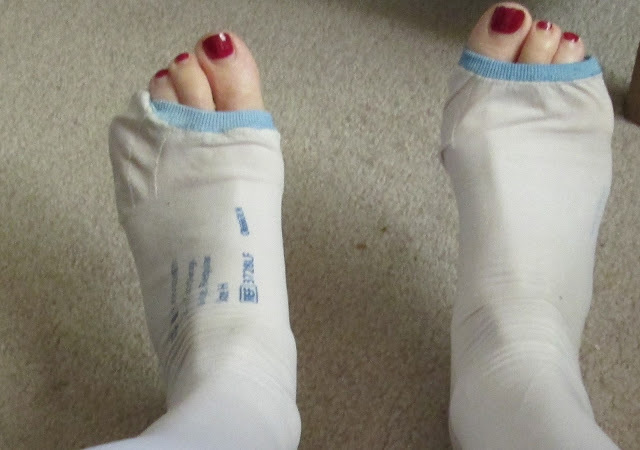 TED hose are worn to help reduce swelling and increase circulation in the legs. They are available in both thigh and knee high lengths in a variety of sizes. TED hose should be worn as recommended by a health care provider. The stockings must be taken care of properly to maximize their effect. Knowing when to change and replace them helps to insure they are being used properly. TED hose are worn for specific periods each day. A health care provider will determine the amount of time per day an individual wears TED hose. After each recommended amount of time wearing the hose is reached, the hose should be removed and properly cleaned. Changing TED hose after each use can help lengthen the amount of time each pair will last before needing replaced. This also allows the TED hose to be washed and dried completely before their next use. TED hose should be changed immediately if the become wet or soiled. If the recommended amount of time the hose should be worn has not been met when they become dirty, change them and replace with a clean, dry pair. Wearing TED hose that are damp or wet can lead to skin irritation and discomfort. When the hose become dirty they need to be removed and cleaned before their next use. Dirty TED hose can hold germs and bacteria which can lead to infections if allowed to enter the body. Change TED hose if they become ripped or snagged. Anti-embolism stockings are designed to (and made of material that allow them to) gently compress, or squeeze, the legs to increase circulation and decrease swelling. Anti-embolism stockings that become torn or snagged cannot work properly since tears and snags prevent the hose from compressing the legs as desired. Change TED hose when they become ripped and throw the torn pair away. TED hose should be changed if they become too loose or too tight. They are designed to squeeze the legs gently. If the hose become too tight, they can cause harm and impair circulation in the legs. Anti-embolism stockings that fit loosely prevent them from doing their job by not allowing the legs to be compressed by the hose. Proper fitting hose are important to ensuring they do the job for which they were designed. Ill-fitting hose should be changed and replaced with a properly fitted pair.